Clearing your browsing history on Chrome browser from time to time is a good habit to get into. This action helps to protect your privacy and prevents anyone with access to your computer from gathering information about you by taking a look at your browsing history. Like all other web browsers, Google’s Chrome browser too maintains a record of where you go on the internet, which websites you visit and other information related to your browsing sessions. Ideally, your browsing history should only include websites that you go to on your own. However, many a times you could land up on websites that you never intended to be on, and all such websites also get included in your browsing history. This is yet another reason as to why you should be deleting your browsing history. As you can see in the image above, your Chrome browsing history page provides you with two options. You can click on the “Clear Browsing Data..” button to remove all your browsing history from this page or click on “Remove Selected Items” button to remove only those websites that you have selected (check marked) for deletion. Another point to note is that your browsing history on Chrome is ordered by date. This is designed to allow you to go back in time and look for a link to a helpful article (on Techbout!) that you remember reading and want to make use of or show it to someone else. Follow the steps below to delete your browsing history, saved passwords, web caches, and other data stored by Chrome browser. 1. Open Google Chrome on your laptop or desktop computer. 2. Click on the 3-line icon at the top right corner of your screen (See image below). 3. From the drop-down menu, click on History to open your Google Chrome browser history page. Note: you can also get to your Chrome history by pressing Ctrl + H key combination on your keyboard. 4. 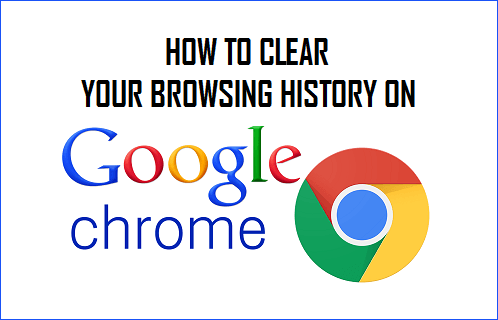 As mentioned above, you can either clear all your browsing history and data or remove selected items from your Chrome browsing History page. In this case let us select Clear Browsing data. 5. On the next screen, you will see a list items with a tiny check box next to them. Using these check boxes you can choose to delete your browsing history, cookies, passwords, Auto-fill data and others (See image below). Once you have made your selection of browsing data items to delete, click on Clear browsing data at the button right of the page to wipe out all your Chrome browsing history and data. In this case, you want to preserve most of your browsing history in Chrome, but would like to remove particular website or certain websites from the history. 1. Use the Search box in the Chrome History page to find web pages from that particular website that you want to remove. 2. Go through the search results and mark items for deletion by putting a tick mark against the items that you want to remove. 3. Once you are done selecting web pages for deletion, click on the Remove Selected Items button at the top of search results. 4. You will see a popup asking you to confirm that you do want to delete pages from your search history. 5. Click on Remove to clear selected items from your Google Chrome Search history. In case you have lots of items to remove, putting a check mark against all items that you want to remove will become time consuming. However, there is a little trick that gets the job done with just 2 clicks. 1. Click in the check box next to the first item that you want to delete. This will put a check mark for the first item. 2. Scroll down to the bottom of the page and identify the last item that you want to delete. 3. Now, press and hold the Shift Key and click in the check box next to the last item that you want to delete. This action will select all the items between the first and the last item.